Last week for my Current Crush Thursday post, I showed a selection of black and white fabric I am lusting after to make myself a scarf. This week I am repeating the theme of fabric but rather than black and white it is instead these cute little creatures. It's not just fabric that I am lusting after. Anything owl related makes me happy. I love a selection of Owl sewing bags and boxes in John Lewis at the moment, and especially love the Cath Kidston owl scissors and case. I feel I really need to indulge in some Owl fabric and will be buying some and featuring it heavily in Harry's room if I can. 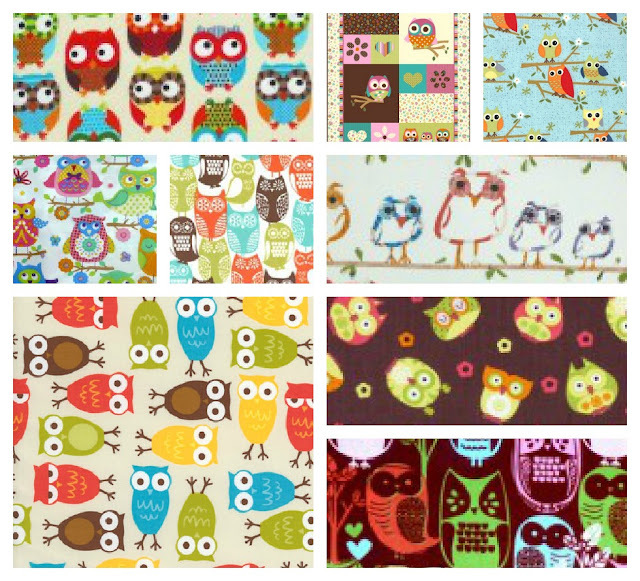 I am in the process of choosing which Owl fabric I want for the bunting I am going to make. And I also want to buy some owl fabric for cushions in his room too. Tonight I think I will finally take the plunge and purchase some fabric. If I keep just talking about it and lusting after them then I will never get round to it.